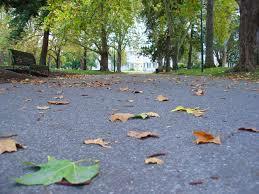 Melbourne in Autumn – a Writer’s Delight – Especially for Poets! 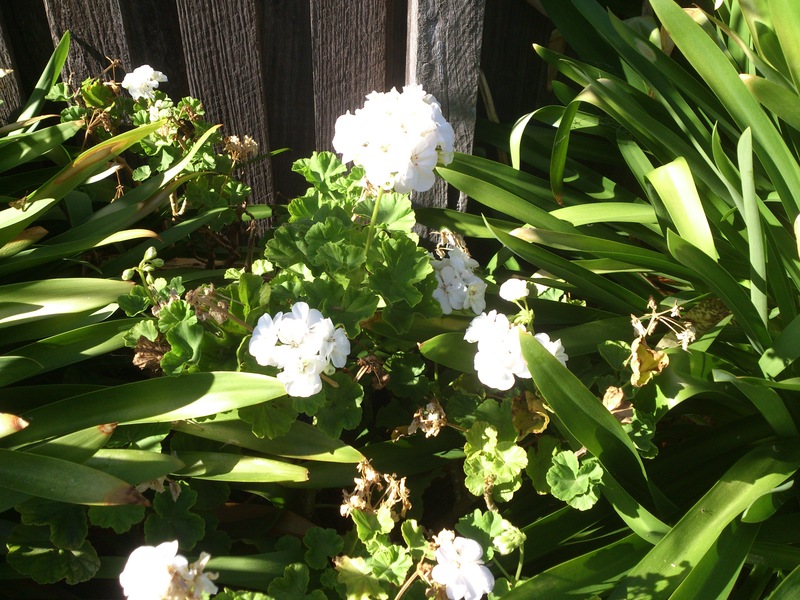 We farewell summer to greet autumn and I’m grateful Melbourne has distinct seasons. I’d hate to live somewhere without a changing climate for inspiration to write. (Not to be confused with climate change!) It is cliched I know, but the seasons are metaphors for our journey through life. In Melbourne, known for having four seasons in the one day, autumn days usually begin with worrying about something as fundamental as what to wear! can be quite a pain. This morning, as I look out the window, the house over the railway line is barely distinguishable from the filmy grey wash of sky. Faint bruises of clouds drift from the sea, promising a dullness to the day as a breeze carries the chilly air from the foreshore to swish through open windows. Hopefully, by lunchtime, the sun will remove the blanket of autumn haze, and blue sky will triumph. boats happy to leave the confines of the creek. soaking up the autumnal sun. as groups and singles lay claim to a patch of sand. often seen offshore on warmer days. myriad hungry eyes ever-watchful for a feed. No butterflies are flitting gaily in the garden. Instead, the agapanthus droops and die, their brilliant purple flower head replaced by a crinkled fawn and faded green petals nursing tiny brown seeds, ready to drop and hide until spring. The wind is not strong enough to whip fallen leaves and other debris to skitter along the street like children let loose in a playground. An Indian Myna sighs and whistles in triumph from among the Banksia enticing mates to land. 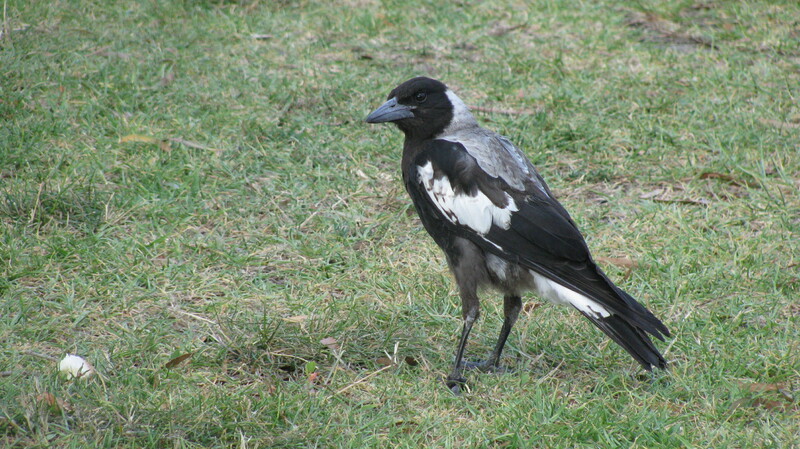 A juvenile Magpie declares to the world, in happy squeals, that he now hunts and fends for himself. While his parents perch proudly on the overhead wires chortling and singing his praises, he makes considered stabs at the earth in a steady sweep of the nature strip. 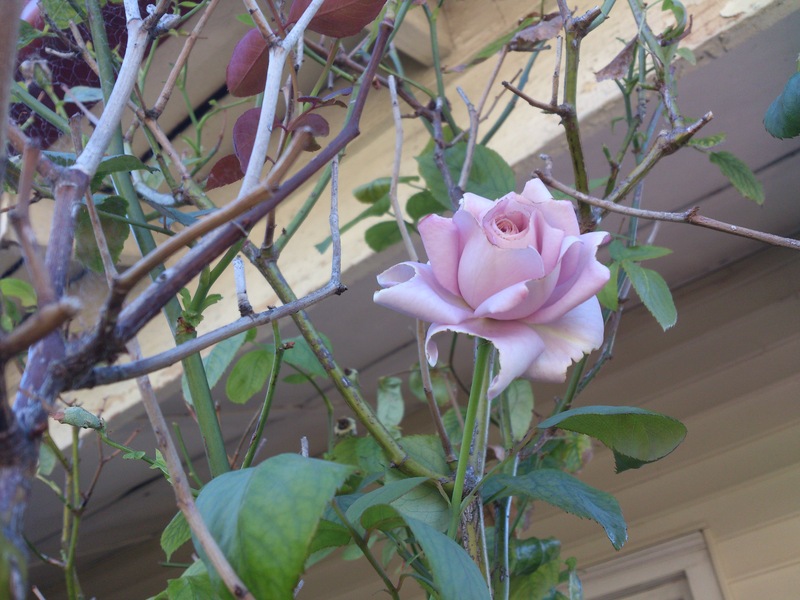 A single Blue Moon rose brightens my verandah, and I focus on its delicate beauty, ignoring the scabbing paint that needs renewing and the couch grass to be removed before it chokes the flowerbeds. 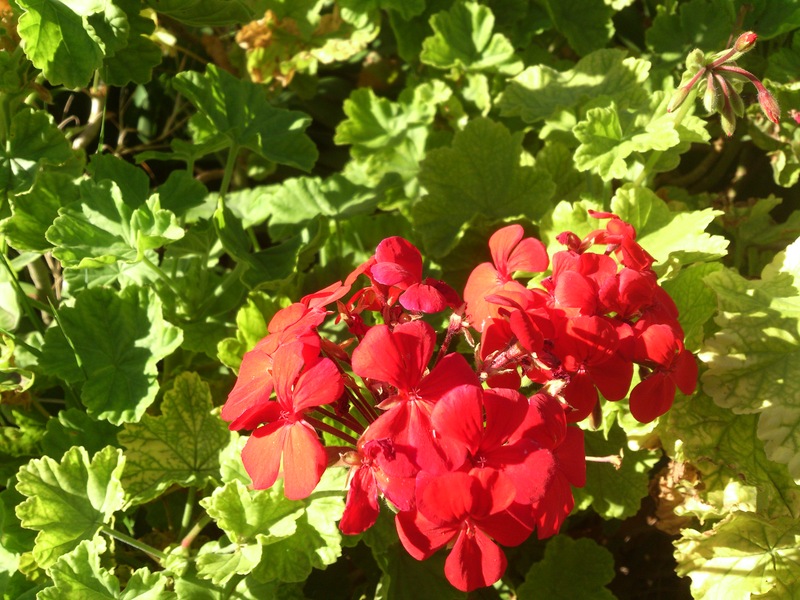 At least the geraniums splash a red, white and pink welcome to the constant stream of passersby on their way to the station or shops. pulled from their cosy beds. loosened from their choking grip on tender plant roots. admiring white daisies guarding the mailbox. joyful satisfaction declared with distinctive bark. and return indoors for yet another cuppa! until too exhausted to cavort. until darkness permits more fun. Despite the formidable reputation of Scotland’s weather, my early childhood is filled with memories of playing outside, especially during the long summer school holidays in July-August, but even at other times during the year. Autumn days in the northern hemisphere, as I’ve mentioned before, were taken up practising for Halloween and Guy Fawkes’ night. I’ve written about Guising and Galoshens, published here and about collecting ‘pennies for the guy’. I recall more time spent playing hopscotch, skipping, tramping over the fields and hills among the heather (corny as that sounds) than anything else. We also played British Bulldog and the robust Relievers – boisterous games, which certainly kept us fit as well as warm. We performed impromptu plays for each other, along with the regular games of Cowboys and Indians and Robin Hood and his Merry Men, which reflected the influence of the fledgeling British television industry in the 50s and 60s. The yet to be developed, and newly established backyards and front gardens of the houses in the new Braeside development took on many personas. Indian badlands, seas populated by Captain Pugwash and his inept pirates, Sherwood Forest, Cinderella or Sleeping Beauty’s Castle, Colditz prisoner of war camp, and many other land or seascapes from island to a desert. Locations and scenarios limited only by our fertile and stimulated imaginations fed on books, comics, television and radio. The first couple of years in Australia we transplanted many of these games, revelling in much kinder weather. We could play outside for most of the year – no need to hibernate from winter snow. All those childhood hours, playing outside in different continents, provide wonderful memories. We are influenced by everything we have experienced in our lives and many in each generation experience similar things, therefore it’s natural there’s often a familiarity about stories. However, as I’ve discovered in my classes, most people will have stories from childhood or another period of life that can be shared in an original way, if written from a personal perspective including details and their reflections. Courage and Faith, admirable human qualities. Autumn in Melbourne is a time of reflection for many people. It coincides with Easter, the most important Christian festival, and the one celebrated with the greatest joy. I was brought up in a Christian household and have many happy memories participating in rituals that gave meaning to our beliefs and practices. I never knew about the Easter Bunny until we came to Australia, nor did I consider the giving of chocolate eggs as the most important part of the celebration. 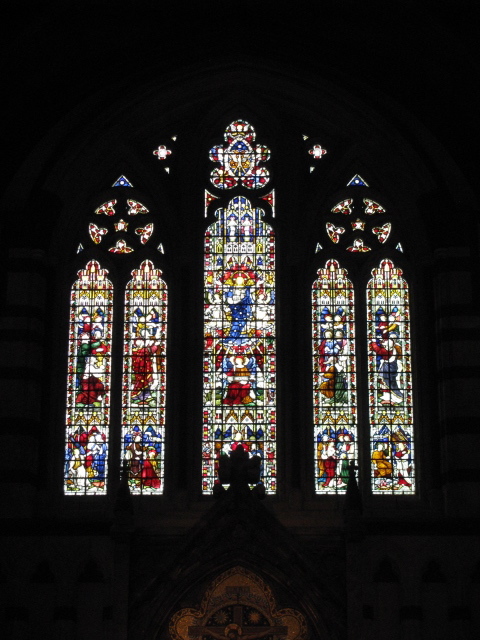 I no longer attend church, but still, value and respect the rituals and beliefs inherited from my parents. I try to avoid the rampant consumerism around Easter that appears to have become the norm just as I avoid the over-the-top materialism that has transformed Christmas. In Scotland, and for many years here in Australia, we painted boiled eggs and rolled them down a hillside, the winner being the family member whose egg survived with the least cracks. This ritual (I think!) 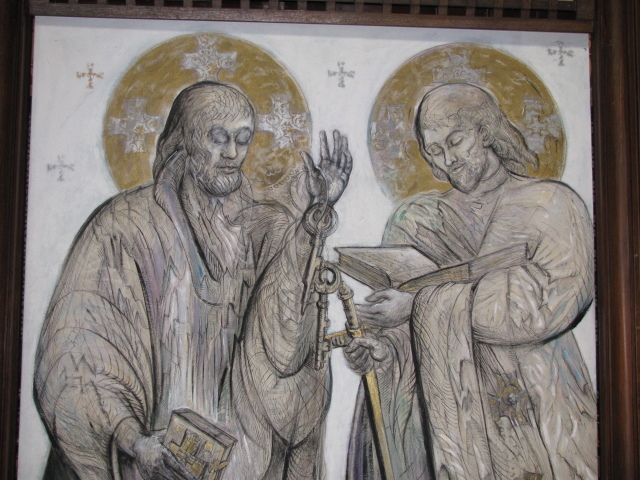 based on the stone rolled away from the tomb where the body of Jesus had been placed. However, the most important part of the tradition being family get-togethers, sharing a meal and enjoying hot cross buns and each other’s company. There was also Pancake (Shrove)Tuesday, which was a treat because Mum was a pancake-maker supremo. All genuinely happy times. As children, we received a chocolate egg or a selection box of chocolate bars to enjoy on the school break that coincided with Easter, and when my children were young, this tradition continued. Many family traditions, including those at Easter, have altered or been abandoned after the loss of my parents, and changing family dynamics over the years with siblings growing older and the lives of our children diversifying. Such is life, which is why recording memoried by writing or with photographs important for family history. Perhaps future grandchildren may revive old traditions (with Fair Trade chocolate and Free Range eggs of course…), or create new ones. As the truism suggests – the one thing constant in life is change! Autumn hosts Australia’s commemoration of WWI on ANZAC Day. A special celebration in 2015 because it is 100 years since the landing on the Turkish beaches of Gallipoli. ANZAC Day a ritual we only discovered when we migrated here in 1962. There is a family link because one of Dad’s Australian ancestors enlisted and went to Gallipoli. George Alexander McInnes, only 19 years old when he died of enteric fever, six months after joining the Australian Imperial Force, raised in Williamstown. He is buried in Chatby Military Cemetery, Alexandria, Egypt. 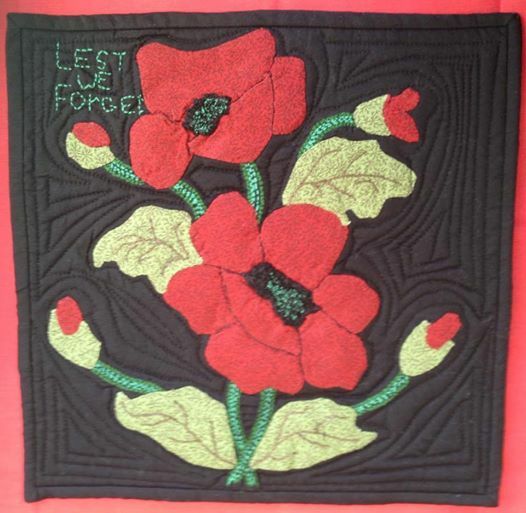 My sister Cate (Catriona), a talented quilter, created the “Lest We Forget” block pictured above. It was chosen as one of the 100 finalists for the particular display at the Australasian Quilt Convention this April in Melbourne. The entries, along with their 100-word stories will tour Australia. missing home and wishing for peace. To end on a happier note – form poetry is fun to try and with traditional Japanese haiku indicating the season is an expected feature. However, like everything else tradition does not always win and expectations not always achievable. What differences do you see when the seasons change? Do you have rituals you follow? Have you written about them? Why not start now! Five things Mairi: Sitting here researching men who went to war from the Bingi area and stopping to refresh my mind by reading your blog, I note one of your ancestors as being a McInnes serving from Australia – and the man I am currently researching is a McInnes from here! Not the same one but close!! and would love the idea if replacing it with a cutting from you. Last and fively, would you do me the honour of allowing me to use your ‘Postcards from Gallipoli’ piece (minus your relative’s name) in a small display – as part of a larger outdoor commemoration – I am making in our local hall for the Anzac Centenary for the local Binginwarri people? Okay Kaye:) First of all you can use my poem or any of my writing just as long as you acknowledge me. I’m very humbled you think it’s good enough to use. It wouldn’t surprise me if the McInnes’s are related, even distantly, especially if the families originated in Skye – where my father’s family is from – McInnes is the second or third most common name there after Macleod and MacDonald. George was born here in Williamstown, but his father Angus moved there from Warrnambool area and prior to that was a seaman from Skye. He fell from the mast of a sailing ship and was offloaded in Melbourne to die, but being a stubborn Highlander he lived:) was collected from the hospital by cousins and taken to Warrnambool where apparently a lot of land was owned by the McInnes’s. 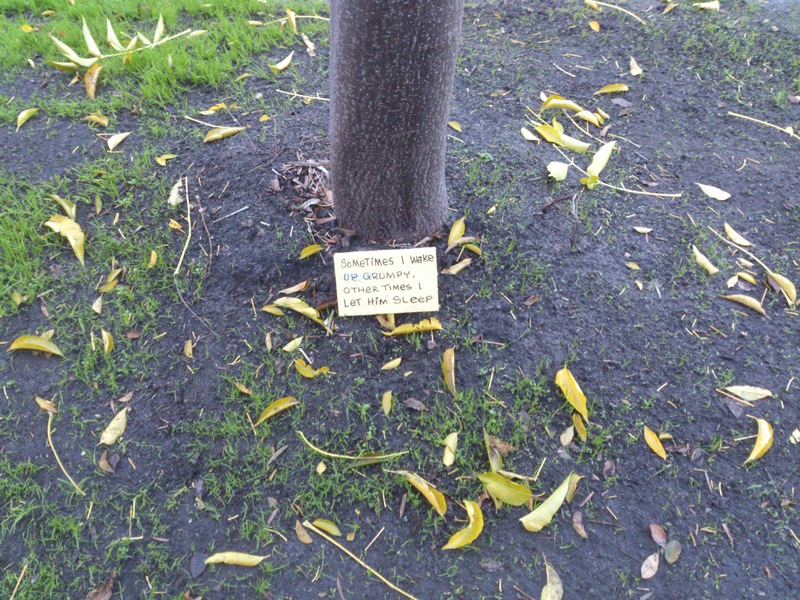 The plaque beneath the tree is just a joke – it says ‘don’t wake up Grumpy’. I took it when out walking in Chelsea Heights one morning. the tree was on the nature strip and there was a rolled up newspaper a couple of feet away – and it tickled my fancy – the scattered leaves let’s you know it’s autumn. And yes I have that wonderful grevillea – the wattlebirds love it. It’s in the front yard and even if I’m not home please feel free to take your cutting. I came by most of my plants that way, or as gifts – some were even bought at Bradshaw Park fundraisers, probably nurtured by your tender hands! And thank you for always being so positive about my posts and being kind about my poetry. PS: The seeds look black to me – I’ll take a pic and message you.